The oven felt like it was 900 degrees but Sue let me know that the two fire “holes” on either side of the main oven were at least 2300 degrees. We were at a glass blowing workshop at Ox-Bow, the Art Institute of Chicago‘s summer program in Michigan, and at first I thought that literally ‘playing with fire’ would not be my speed. But much to our group of seven’s surprise, we began working the glass and hot ovens within about an hour of our instructor’s tutorial in the glass studio and were making glass. 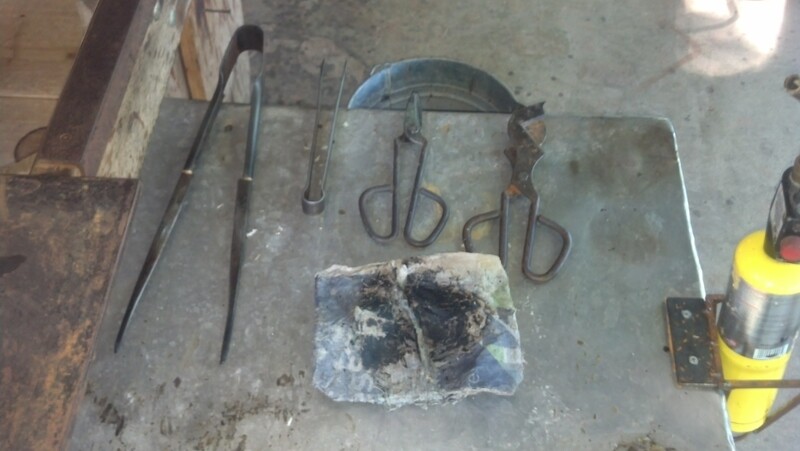 For three days we worked almost eight-hours a day, learning the ancient art of glass blowing and skills like jacking, blocking, shearing, blowing and keeping the body relaxed as part of the craft of glass-making. These were no small things. Working with fire, high heat and the time pressure of cooling glass, one wrong move meant injury, burns and more significantly for our sort-of-competitive group, a broken piece. Admittedly, Day 1 consisted mostly of making glass blobs and later, some interesting paperweights – all in the name of learning how to use the “pipes”, gather the liquified glass from the oven and begin the process of working with the material. It also set the foundation for working in teams. Glass work is typically not a solitary toil — a lead artist tends to direct a team, who assists with blowing the glass and other assorted tasks such as reducing the intense heat from the glass with a properly placed paddle. When Day 2 dawned, our group felt confident despite a few minor surface burns the previous day. I was particularly impressed with myself from Day 1 – few jitters and no burns. Going in to the class, I worried briefly about how I’d handle the fires and my proximity to them. Over the years, I experienced a few, mostly minor, reactions to fire ranging spontaneous heat rash to persistent sensitivity to hot and cold weather. When I burned my leg, whatever remaining skin was left was removed through a surgical process called debridement. New skin grafts were placed over the remaining muscle and bone, resulting in scar tissue and a fair amount of nerve damage. It never troubled me in any meaningful way and I’ve had full and complete use of my leg all my life. I’ve always felt that as a burn survivor, I am a lucky one. Even with the glass blowing class, I never felt it was a challenge to overcome fire in any way — I’ve long been over that — but simply an exciting skill to learn. And then Day 2 brought the wadded newspaper tool. 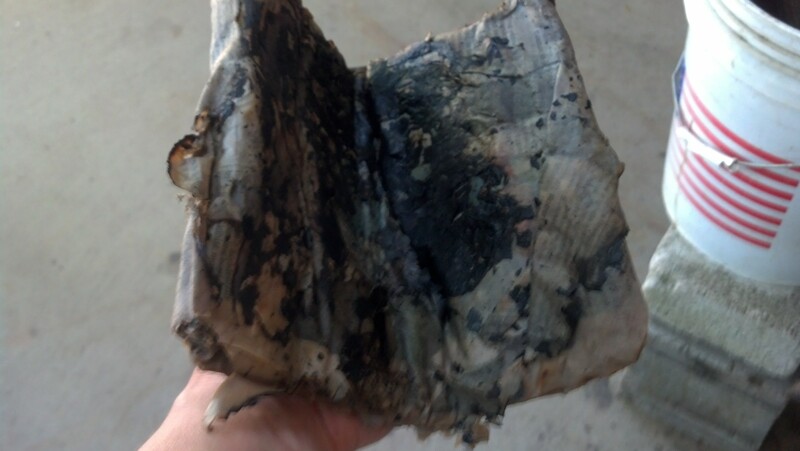 The ” tool” consists of six to eight sheets of newspaper, literally wadded together, folded over, drenched in water and held in your hand. As part of the glass-making process, an artisan takes a “gather” of molten glass from the main oven and begins a process called marvering on a metal table to elongate and flatten the glass. Moving to a specially designed bench, the artisan then smooths and/or blows the glass out, using one of a variety of tools — the jack, a wooden cup or the newspaper — depending on the goals for the project. In the day’s demonstration our instructors Jonas and MC showed up the form and approach to using the wadded newspaper. It all seemed like a textbook approach. I felt ready. But when I sat in the chair, using the newspaper to guide the glass, I felt the heat sear through my hand. My reaction was visceral. I felt the heat not only through my hand but come up through my right foot like phantom heat. “I can’t use the newspaper,” I blurted. “I can’t.” Calmly, MC the instructor responded. “No problem. There are always other ways to do the same thing with glass. Let’s give it a heat in the oven and marver it again.” I put the newspaper down and the sensation went away. I looked at my team mates Susan and Ann and they appeared nonplussed. Inside, my heart was racing and I felt pangs of heat shooting through my body. I took a deep breath, walked the pipe to the oven and gave the glass a heat. By Day 3, I decided to pick up the newspaper tool again and used it without incident, creating two bowls, a yellow glass and a big ole, colorful paperweight. This was an awesome experience. Playing with fire wasn’t so much about fire but about understanding an ancient craft, working with friends and moving behind my limits. I am not afraid of fire in any way. It simply ignites the work in so many dimensions. 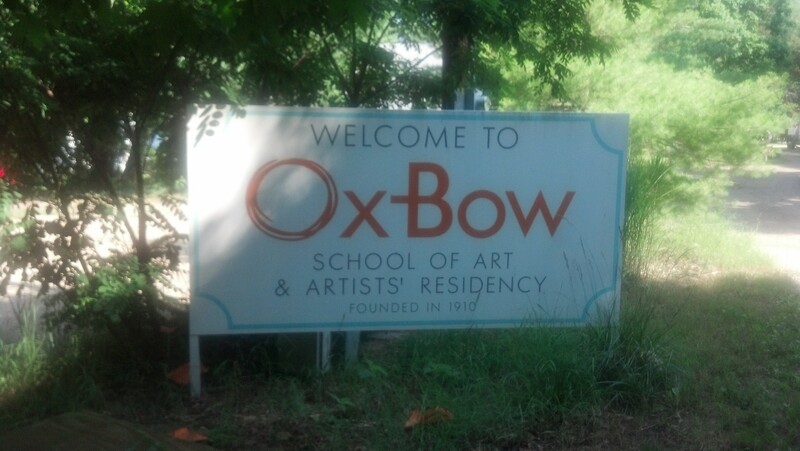 Thank you Louise Silberman for creating this opportunity and for your support of artists and artisans at Ox-Bow.